Alley and Jacob traveled to Moab, Utah for their adventure elopement wedding last fall. They invited their parents to join for their intimate ceremony in Canyonlands National Park and then rented a jeep so they could explore more of the 4x4 roads around Moab. Alley’s Chantel Lauren wedding dress perfectly complimented the desert environment around her! Josie and Justin started their elopement wedding day with a sunrise first look in Arches National Park and then ended the day with an adventurous sunset ceremony near the Fisher Towers. The first time Callen and I ever came to Moab, it was not quite love at first sight. We made the mistake of coming in August at the height of tourist season and one of the hottest months of the year. It was 100 degrees when we went to bed at 11pm and 114 at the hottest time of the day. We were enchanted by the desert, but exhausted after a 30 mile backpacking trip earlier in the week and cursed the heat. Once we got home from that trip, we decided to give Moab another chance in the fall. This was possibly one of the most formative decisions we’ve made, as that return trip completely changed our views and made us fall head over heels in love with Moab, Utah. Not only were we able to explore so much more of the desert in the perfect October temps, but we also got a tip from a local to head into the mountains nearby for the fall colors. We, like many Moab newbies, didn’t think of it as a mountain town and were pretty surprised by the suggestion, but a ton of our favorite spots and hikes have been suggestions from locals, so we spent the day driving through the mountains with our jaws on the floor. The fall colors amazed us (we both grew up in Texas where fall is more of a fantasy used by stores to sell merchandise than an actual change in outside weather) and we were completely blown away to find beautiful mountains just outside of the desert we’d fallen so in love with. On that first trip, we wandered far and wide and found ourselves a dreamy little meadow with a perfect mountain on the horizon. We pulled out our still-new Pendleton Blanket (my favorite wedding present) and sat in the field taking it all in. Sometimes I wish I could go back to that day and tell my past self how much this place would change me, that I’d one day consider it home, and it would be the source of so many amazing adventures, life changing experiences, and deep friendships…which brings me to: Devyn and Adam! We met these two almost a year ago. They live in their van too, and we had some mutual friends so Devyn slid into my instagram DM’s and basically told me we were going to be friends now :) She invited us to their van for a home cooked meal, which we pretty much never turn down, and the rest is history! Honestly though, we connected with these two right out of the gate, talking about everything from rock climbing to skiing to having real jobs on the road to more rock climbing. Devyn made us incredible quinoa bowls with so many delicious ingredients and my standard for van meals have skyrocketed since (seriously, this girl does things like marinading steak and has her own spice rack IN A VAN, unreal). We spent the next two weeks hanging out nearly every day whether it was parking next to each other at the best spot in Moab for work days or going climbing or car-hiking a new dirt road. Devyn’s encouragement got me stoked on climbing in a way I haven’t experienced before, which has become a common theme in our friendship (see: ski photos in this blog post!!). When the time came to say goodbye and head different directions from Moab, we promised to get back together later in the fall when the desert returned to reasonable temps. (Although, bonus, our paths crossed for a few days in Yosemite!!). This fall in Moab was one of the best seasons of my life, so full of adventure and wonderful days off between really fun elopement + adventure session gigs. 2018 was a really good year of friendship for us, when our communities really began to grow out here on the road, and it felt like this fall was a beautiful culmination of that when a lot of our people found themselves in Moab. We had some great adventure days with Devyn and Adam and we got to introduce them to a lot of our friends that came through, as well as my family that came to town for Thanksgiving! As the season was coming to an end, we began thinking of a last adventure we’d do together before feeling Moab for the winter. I remembered these little huts in the mountains that you could ski out to and casually mentioned it to Devyn. She loved the idea, and before I knew it she was texting me price estimates and asking if we were in. Once I confirmed we could make it happen a few hours later, Devyn revealed she’d already booked it the day before — she knew we were going to do it! We originally chose the easy hut that was a shorter distance but some plans changed with the company and they moved us to the farther hut. 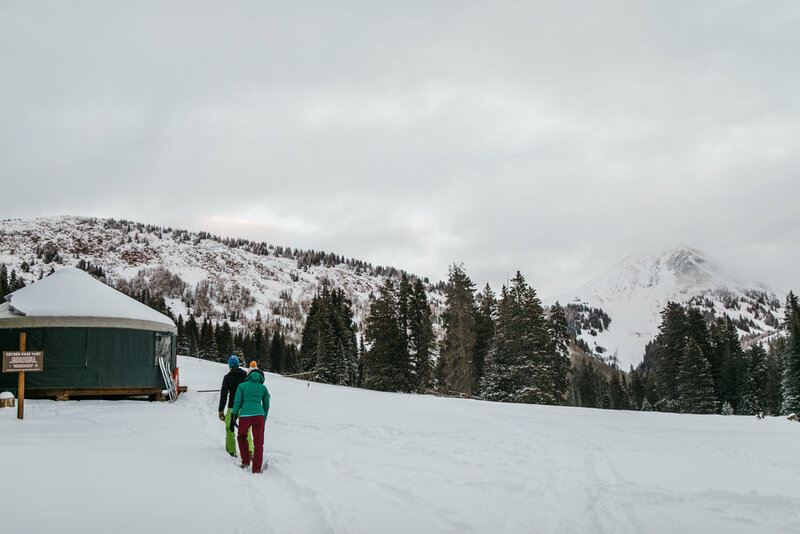 I was a little worried considering I’d never XC skied in my life, but…the new hut happened to be just steps away from that meadow Callen and I found way back when we fell in love with Moab, and the idea of finding myself in that meadow covered in snow was enough to motivate me! The adventure itself was such a blast - we recruited more friends and Callen and I managed to pick up some old skis at the used gear shop in town (Moab Gear Trader — highly reccomend!) the night before. 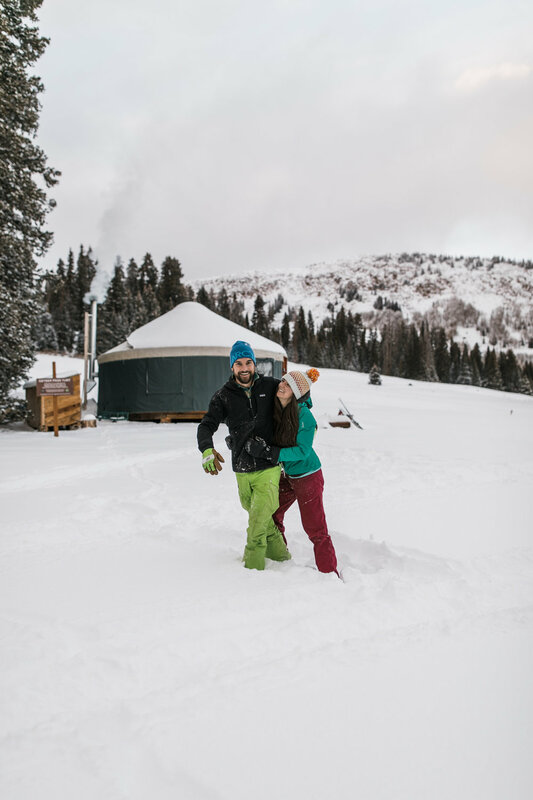 We skied 4 miles out to the yurt, arrived before sunset, and Devyn made us some delicious stew while we snacked on charcuterie and champagne (remember what I said about Devyn’s food making skills!). We all crashed around 9pm, waking up every few hours to stoke the fire and keep our little yurt warm. The following morning, we woke up to over a foot of fresh snow!!! Which was absolutely beautiful, but it also meant our 4 miles back “down” was breaking trail the entire time, and ended up being even harder than going up! I am pretty sure I wouldn’t have made it there or back without Devyn’s constant encouragement (and her handing me energy gummies when she could tell my morale was depleting). I am so thankful for these friends, so incredibly thankful for this adventure, and so stoked for their wedding later this year!! 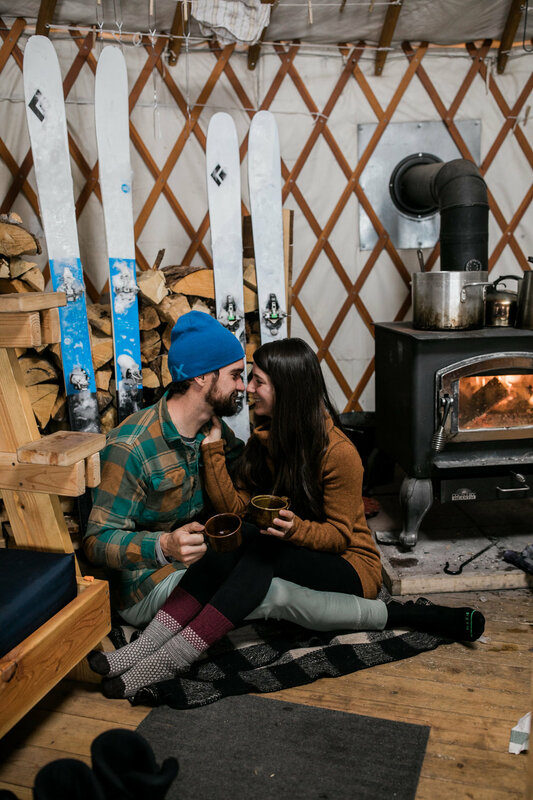 We did a more “normal” engagement session with them in Moab that I’ll blog later, but it was super fun to take these photos of them in their element, wearing their brightly colored ski clothes, and cozied up in the yurt in their base layers. It was especially cool for me when we walked out to that same beloved meadow that Cal and I found so many years ago and watched the fiery sunset on the horizon as the storm blew in. 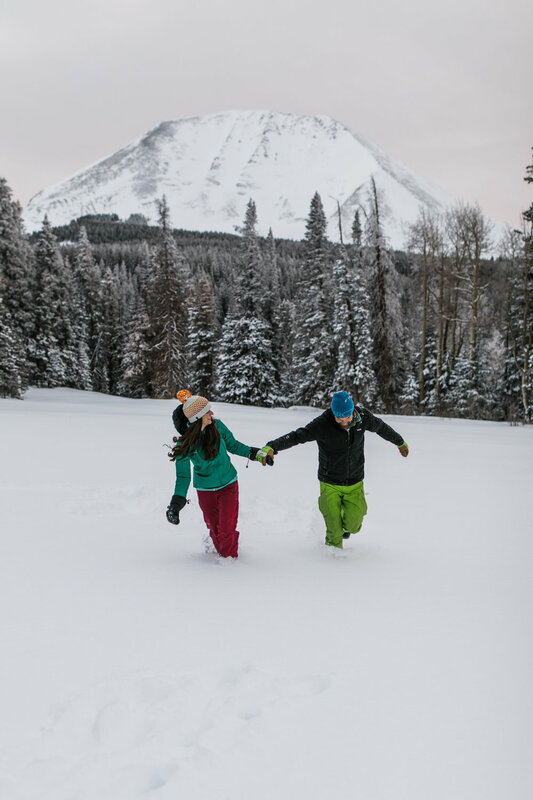 We love it when our couples have a tie to the place they decide to have their adventure wedding pictures taken. 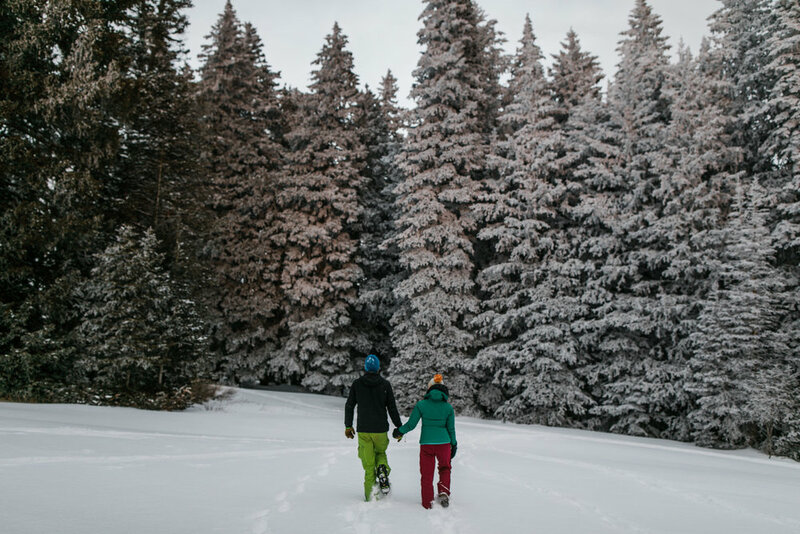 In the past, we’ve had a couple choose to elope in Zion National Park because they met on a hike there, or road trip together through Moab, and they want their adventure wedding or engagement to take place there. However, when Heidi and Gordon reached out, they told us about their connection which goes back longer than any we'd ever heard of before. 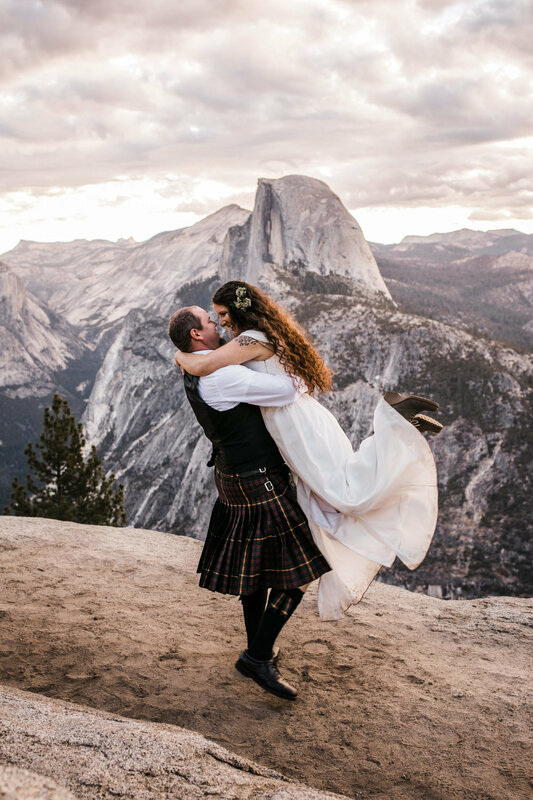 Shooting their adventure wedding in Yosemite brought with it a sense of depth, history even, as the attachment goes back over 148 years ago! Her family had settled here, among the first to do so, in 1870. For perspective, this means they were neighbors with John Muir, who lived here from 1868-1874. Her Great Great Grandpa Mcauley built the trail which connects the valley to Glacier Point and lived here well before the park even had boundaries (which happened in 1889). 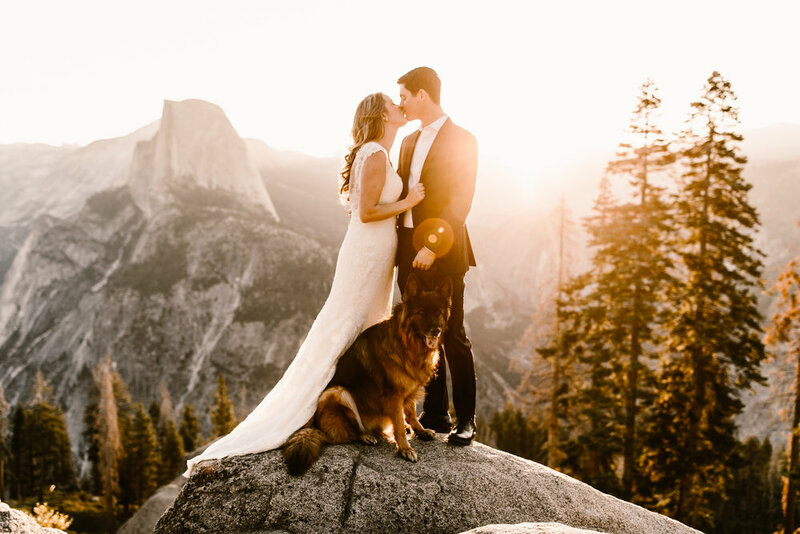 We joked about how this was Yosemite's "Royal Wedding" which would make Heidi the Princess of Yosemite, but seriously, her connection to this place was absolutely amazing. We shot in the park at sunrise and sunset, Gordon and Heidi walking among the very granite her family had for generations. At Glacier Point, she pointed out a plaque with her Great Great Grandfather’s name on it, commemorating all he'd done for this park. Gordon and Heidi held hands, walking to the edges where he started the tradition (which lasted nearly 100 years before ending in 1968) of the Yosemite Firefall. We snapped some shots of them silhouetted above the valley. I imagined the silhouette of her ancestor, pushing glowing embers off the cliff in the same golden light, letting them fall for the spectators below. They brought their beautiful German Shepherd, Chelsea, along for some portraits (Yep! Yosemite has a couple of dog-friendly places! ), and we took our time strolling around the upper valley before their wedding the next day. 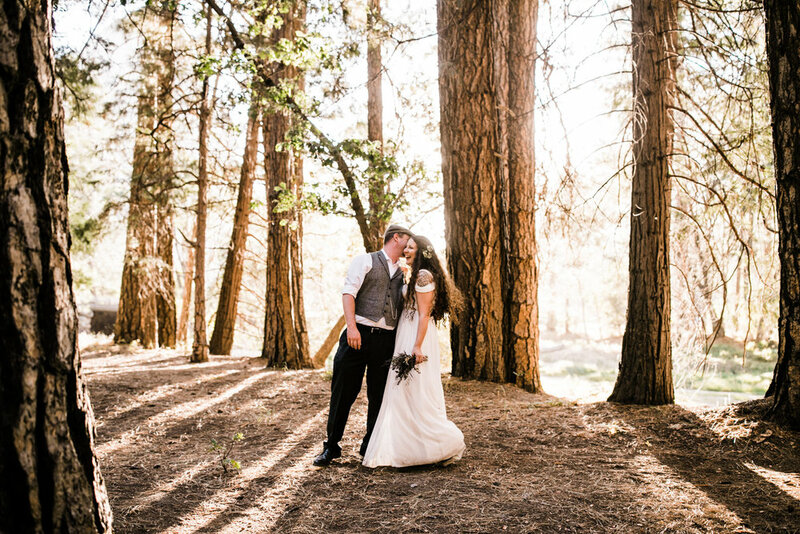 The ceremony was set to be an intimate little wedding in the Yosemite Chapel where her uncle had been the pastor for a few years in the 1970s (crazy we actually have to state which century that was in). I imagined the likelihood of Ansel Adam's walking around the valley with her family there, stopping in at Degnan's to grad some food prepared by her ancestors which started the iconic restaurant. Maybe he even snapped a few photos of their family back in the day or talked with one of her great grandparents, asking what it was like before his first trips to the valley in the early 20th century. Gordon also has a connection to Yosemite, having grown up visiting and even through-hiking while doing the PCT with his friend (best man). 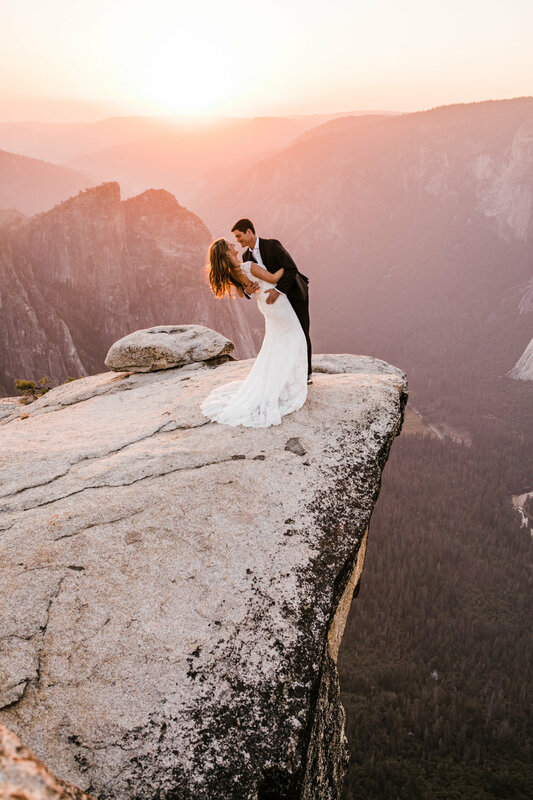 He had no idea on those initial visits he'd one day be "marrying into" the Yosemite lineage. Obviously, this was all just special because it was Gordon and Heidi's wedding day, their love, the personification of their personalities, interest, and style in one day, but the weight of it all was undeniable. With a connection like this, I imagine some far-off day in the future, Heidi and Gordon's Great Great Grandson maybe walking with his girlfriend, dropping down to a knee and proposing, or maybe holding his fiance's hand as they get married here. Someone will write about their wedding and talk about how much this place has meant to his family over the past 250 years. And they'll put in one of the photos from today and underneath will be a little caption that simply reads "They were engaged right where this photo of his Great Great Grandparents Gordon and Heidi had was taken, the day before their wedding, on September 6, 2018". When Morgan and Trevor reached out we immediately connected to their bold and energetic personality. They described themselves as adventurous, resourceful, and talked about how much they loved exploring. "We just love to get in the car, put some good tunes on, and drive." Morgan went on about how they met, what they do for fun, and the funny little things about their relationship like texting lyrics to forgotten 80's songs to each other and taking picnics. 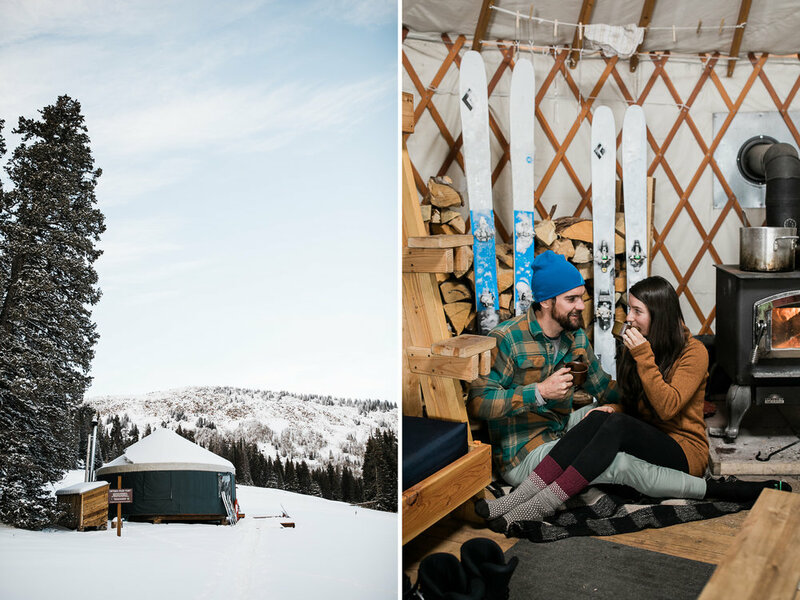 We love how our couples always bring their own twist to their adventure wedding and were stoked on everything Trevor and Morgan brought to the table. 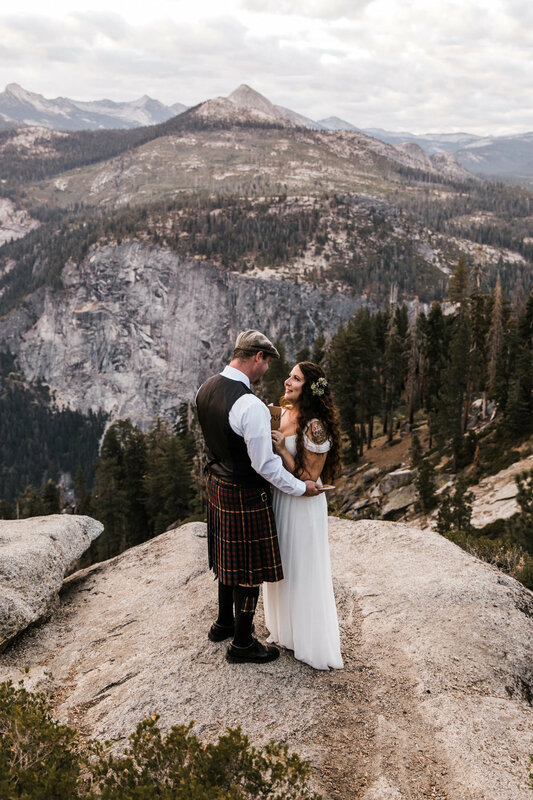 When we were planning their wedding day in Yosemite it came together perfectly - the kilt, the sunrise session, their incredible energy - it was so unique to them and we were stoked on all of it! 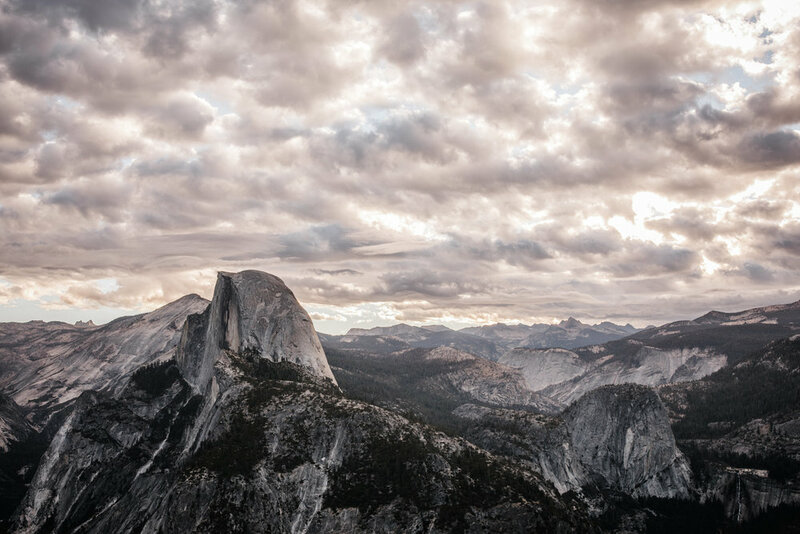 The day started with pictures of their first look at Glacier Point. The sunrise was epic and there was a sweet little twist. Morgan and Trevor chose to take a little time at sunrise to spend just the two of them, reading their vows to each other before the ceremony. It was super emotional and touching to snap some pictures from afar. We then had a little while to explore around, kind of moving like Morgan described in her initial inquiry, just going and looking for whatever caught our eye. Trevor was mainly just keeping his eye on Morgan which was super cute, but the views of the valley lit up amazingly with a perfect coat of high covering clouds which allowed us to stretch the morning light out quite a bit longer! 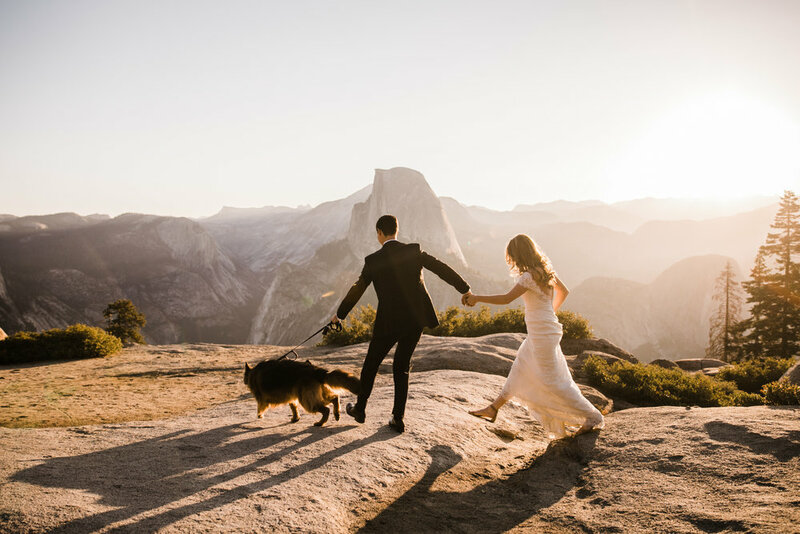 We headed back to the amphitheater at Glacier Point for an intimate little wedding ceremony with friends and family. Their officiant was great and the whole thing was super fun and personal! The ceremony ended with cheers and a time for everyone to hang out and take in the views. 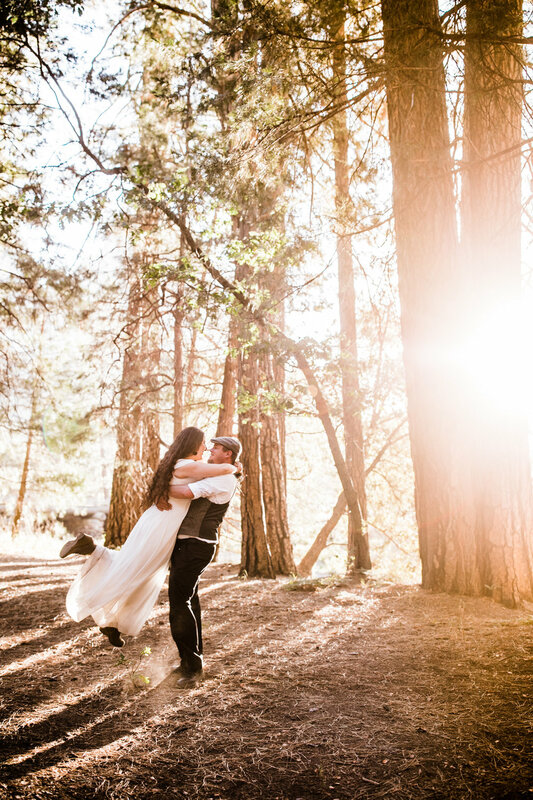 We've done all sorts of weddings in Yosemite, and I love how each one fits the personality of the couple so well. Today, I watched how everyone celebrated the new couple. Morgan and Trevor were glowing, it seemed perfect for them, the people closest to them, just enough to fit into a couple big hugs, brought together to explore and witness their marriage in a place they love. The family had some time together after the ceremony to enjoy the park before we met back up for sunset down in the valley a few hours later. We basically just explored more and it felt like we were just playing around in the meadows and forests of the valley. Morgan wore her mother's wedding dress which made for such sweet and sentimental photos. Trevor was having so much fun hugging Morgan, throwing her over his shoulder, walking around beaming with pride and love and excitement. They met 11 years ago and we could tell they were best friends who were so, so comfortable with each other. As the day wound down the sun dipped below the granite walls and the golden light lit up the tall grass we walked through. I imagined we were on one of their trips, in the middle of one of the many great conversations this couple has - "What if we just drove to Yosemite? What if we whispered our vows to each other at sunrise? You could wear your kilt and I'd wear my mothers dress! Wouldn't that be great?" Yes, I thought, it would be quite great.